Joe Greenwood’s two-try salvo in Friday’s 44-4 home victory over Wakefield Trinity Wildcats sent a defiant message to Saints’ head coach Keiron Cunningham - leave me out of the squad at your peril! The second rower had been struggling to nail down a first team spot this season after some eye-catching performances in 2015 when he grabbed 10 tries in 23 appearance. He had only featured in the World Club Challenge showdown with the Sydney Roosters last month but bounced back in style against the West Yorkshire strugglers, much to Cunningham’s delight. The Saints’ boss said: “Joe has been working hard away from the field to capture his form of last season. He has been a bit scratchy in patches but he has been doing some good stuff in training and deserved his recall to the first team squad. His timing and the way to sliced through the Trinity defence were throwbacks to the type of tries he scored 12 months ago, making him an instant hero among Saints’ fans. “He has a great awareness of space and his lines are outstanding as the demonstrated against Trinity,” said Cunningham. Like other youngsters at Langtree Park, including Andre Savelio, Luke Thompson and Greg Richards, 22-year-old Greenwood is still trying to cement a regular first team spot - four players who the Saints’ supremo describes as ‘still babies’ in terms of Super League know-how and experience. 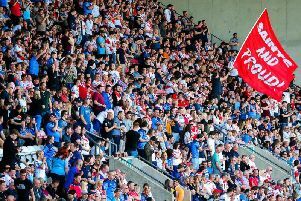 Meanwhile, Saints expect the full house signs will go up at Langtree Park before the end of this week ahead of the Good Friday derby against Wigan Warriors. Yesterday (Monday) only 400 tickets remained in the Hatton Solicitors west stand while tickets in the gold and silver sections of the Totally Wicked north stand and the Solarking south stand are extremely limited. Wigan fans, who will be housed in the McLaughlin and Harvey east stand are expected to snap up their full allocation of tickets.